For most of her life, Juliet Emerline has subsisted – isolated by deafness – making hats in the solitude of her home. Now, she’s at risk to lose her sanctuary to Lord Nicolas Thornton, a mysterious and eccentric architect with designs on her humble estate. When she secretly witnesses him raging beside a grave, Juliet investigates, finding the name “Hawk” on the headstone and an unusual flower at the base. The moment Juliet touches the petals, a young English nobleman appears in ghostly form, singing a song only her deaf ears can hear. The ghost remembers nothing of his identity or death, other than the one name that haunts his afterlife: Thornton. To avenge her ghostly companion and save her estate, Juliet pushes aside her fear of society and travels to Lord Thornton’s secluded holiday resort, posing as a hat maker in one of his boutiques. There, she finds herself questioning who to trust: the architect of flesh and bones who can relate to her through romantic gestures, heartfelt notes, and sensual touches… or the specter who serenades her with beautiful songs and ardent words, touching her mind and soul like no other man ever can. As sinister truths behind Lord Thornton’s interest in her estate and his tie to Hawk come to light, Juliet is lured into a web of secrets. But it’s too late for escape, and the tragic love taking seed in her heart will alter her silent world forever. International and NYT bestselling author, A.G. Howard, brings her darkly magical and visual/visceral storytelling to Victorian England. 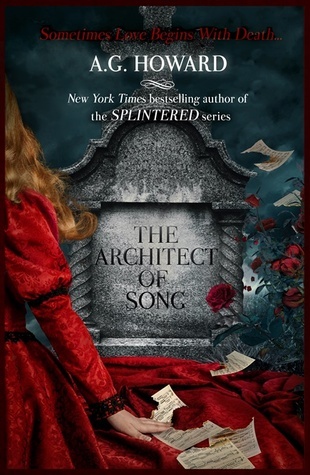 The Architect of Song is the first installment in her lush and romantic Haunted Hearts Legacy series, a four book New Adult gothic saga following the generations of one family as – haunted by both literal and figurative ghosts – they search for self-acceptance, love, and happiness.